Culver, Madras districts both improve with graduation rates over 90 percent. 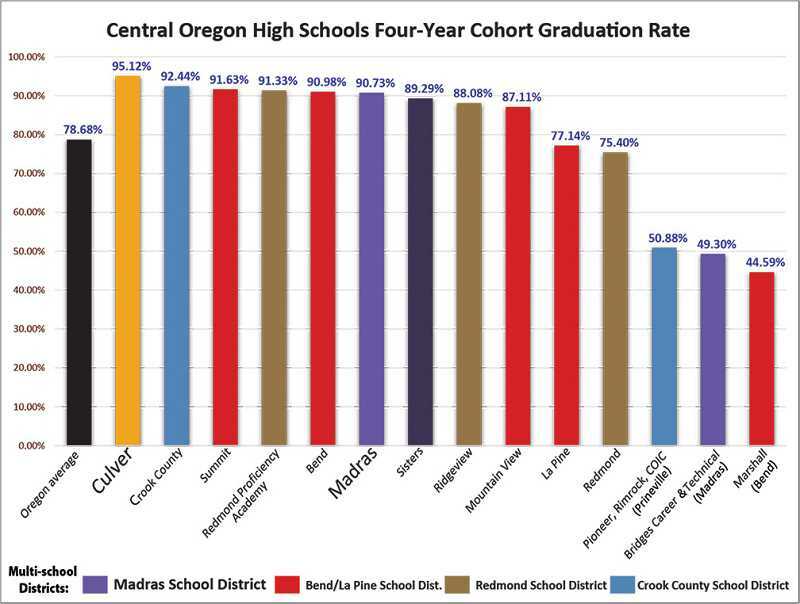 Jefferson County school districts have seen another year of improved graduation rates, according to an annual report released by the Oregon Department of Education last week. Culver School District has seen steady increase in graduation rates in the last two years and this year ended up at 95.12 percent, up just over 11 percentage points from 2016-17. Culver leads the Central Oregon region in graduation rates, according to the report, with Crook County a close second at 92.44 percent. "It's very exciting," said Culver High School Principal Brad Kudlac, about the jump in numbers. "We kind of knew where we were standing," he said, adding that it was exciting to have the state verify those numbers. Kudlac said the high graduation rate is a "big compliment to our families in this community and our teachers." He went on to say that he believes that much of the students' success starts at home and the teachers are the ones working with students every day to accomplish goals. It's about relationships with the students, he said. 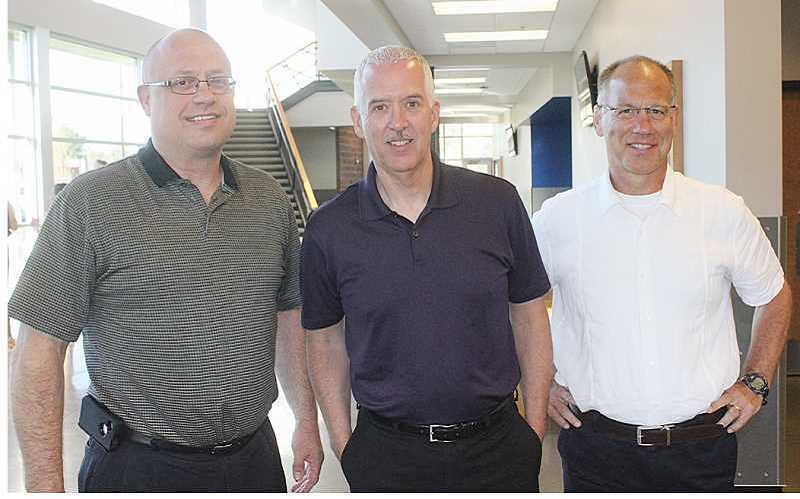 The administrative team at the high school was brand new this year, and Kudlac said that they wanted to work to tailor things to each student specifically, from the beginning, and push kids to be successful. "We can do that in a small school," he said. Jefferson County School District has continually improved graduation rates as well, going from 56.7 percent four years ago, to 77.48 percent for the 2017-18 school year. Madras High School, on its own, has jumped from 78.47 percent in 2016-17, to 90.73 percent for the 2017-18 school year. "We have the same percent, pretty much, as Bend and Summit and are higher than Mountain View," Madras High School Principal H.D. Weddel, said. "We are really excited about that." Weddel said that it is important to the school to be able to say that their graduation rates are at the same level as other schools, because students in the district face different challenges than students from other places. "When we say we can be at the same graduation rate as others, it is an important thing to us, that our kids realize there is no difference, as far as their future, than anybody else," he said. Because the numbers have been increasing, the district plans to stay on its current course. "I don't think we'll change anything we are doing," he said. "We are going to keep doing what we are doing. We think the graduation rate will continue to go up because what we are doing is working. We will continue to evaluate it and continue to get better at it." "Our mind is always about what will help our kids graduate," Weddel said. When numbers like these come out, he said, "It makes us realize that all kids can be successful, (realize) how hard our teachers work, and how thankful I am for a school board that took the risk of creating an alternative school." Weddel highlighted that Bridges High School — the district's alternative school and the other high school that factors into the annual district rate — is important for many reasons, and certainly when it comes to the district's graduate rate. It allows students who may be behind in credits to get back on track to graduate. Without a supportive school board that was willing to give a program like Bridges a try, the district would not be as successful, he said, adding that the district's success really does depend on a whole team of people.